As one of New York City’s largest commuter towns, the need for a quality childcare facility in South Orange, New Jersey is something Dana Kearney noticed early on. Beginning with a babysitting service operated from her home, Kearney used her fifteen years of nursing experience to provide the best care possible for her children and the children of others in the community. As her business grew over the years, she outgrew her small home-based business, registered an LLC and created what is now known as Village Babies Development Center. With a spacious facility, Kearney’s business now offers not only care to children between the ages of six weeks and five years of age, but a variety of learning programs for children in each age category. Offering programs for infants, toddlers, preschoolers as well as an enrichment program, Village Babies has quickly been recognized as a household name for parents in the South Orange area. The development center is comprised of a three-storey building which includes a 1,500-square foot gymnasium on the ground floor, offices and classrooms for infants and toddlers on the main floor with the second-floor space devoted to pre-school classes. In an effort to increase safety in the facility’s gymnasium, the team at Village Babies reached out to us to design and install safety wall padding for placement inside the gymnasium. 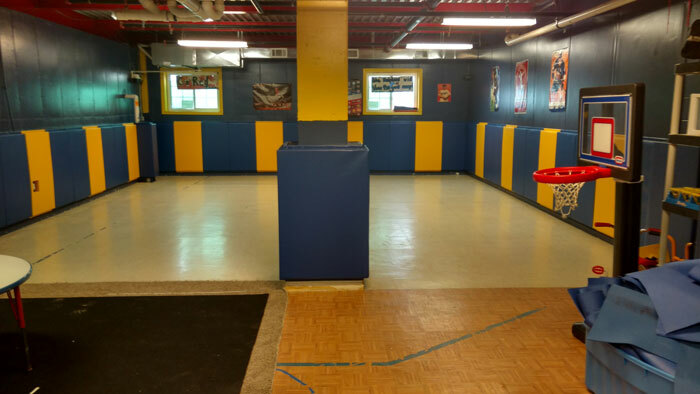 With safety as a number one priority, it was very apparent to the center’s operators that an upgraded safety system was needed in the gymnasium area. Much the same as other gymnasiums, the facility is used for a number of activities, including sports from which injuries could be sustained without the proper wall protection in place. Working closely, once again, with our partners at Tri-State Folding Partitions, together we were able to get the gym wall padding, designed, manufactured, shipped and installed in a timely fashion for the good folks at Village Babies Childcare Center.